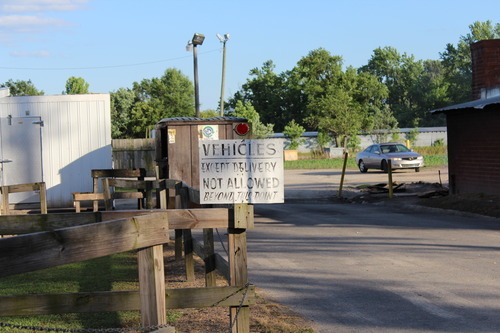 In addition to being a must-stop if you heading east on Highway 70 towards the beach, Wilber’s Barbecue in Goldsboro, NC is a pretty celebrated barbecue joint in its own right. It’s the type of place where presidents tend to stop by and rub shoulders with the locals if they are campaigning in the area (both Presidents Clinton and HW Bush were known to frequent). Heck, supposedly you might even hear folks refer to eastern NC barbecue as “Wilber’s barbecue.” Wilber Shirley began smoking whole hog over hardwood coals in 1962 and my understanding is that it continues in the exact same way today as it did 51 years ago. So yeah, it was a no-brainer for my wife, baby, and I to stop here on our way to Atlantic Beach this past Memorial Day weekend. 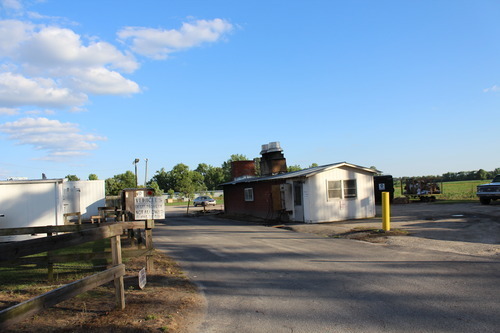 Wilber’s is located in a plain rectangular brick building situated right off of Highway 70, with the smokehouse where they smoke the whole hog for 12 hours over hickory and oak logs located behind it. Sadly, as we pulled into the parking lot at dinner time there wasn’t any smoke going. But I did confirm after our meal that there were stacks of logs out back, presumably waiting for smoking early the next day. 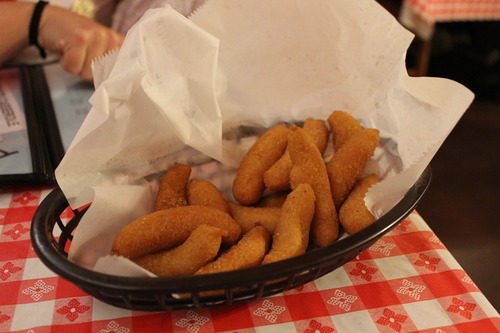 As soon as we sat ourselves, we were immediately presented with a basket of hush puppies – always a good sign. There was also a pitcher of sweet tea already on our table, so our visit started off very strongly. Wilber’s serves barbecue chicken and several seafood items, but neither my wife nor I messed with that and ordered a barbecue plate that came with slaw and potato salad. 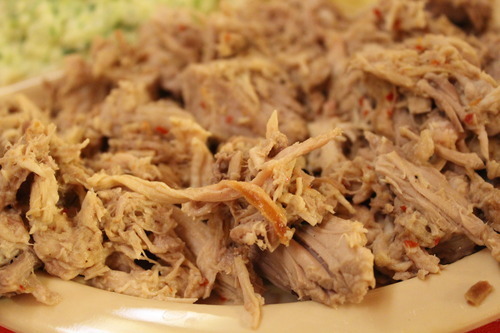 The chopped pork had visible red pepper flakes and a pleasant aroma of smoke. And it was very good, albeit a little too coarsely chopped for my liking. But still, the texture and taste was outstanding. 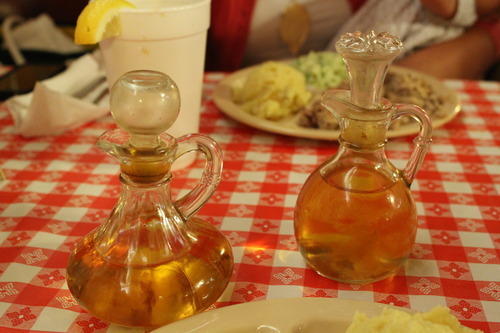 There are two table sauces – a Wilber’s and a vinegar sauce (both vinegar-based with I believe one being milder in terms of spice). I tried both and while both accentuated the pork I didn’t have a favorite. The hush puppies (or “bread” as the waitress referred to them when asking if we wanted another basket) were golden brown, oblong-shaped, and great tasting (though not quite as sweet as I would prefer). The slaw was mayonnaise-based and slightly tangy and I didn’t feel the need to finish it. I don’t necessarily think of potato salad with my barbecue, but what was served was mustard based and reminded me of my grandmother’s so I dug it. When I posted a photo from Wilber’s on social media after our visit, it received a lot of comments and likes because people just plain love the place and have fond memories of stopping here. And while I will always be a Lexington barbecue guy, I can say that I can see exactly why. The food is great and the service is quick and friendly (although I can’t take credit for all of that since waitresses seem to love our little girl). 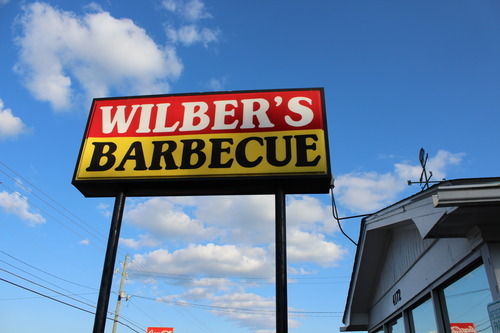 Wilber’s is an eastern NC barbecue institution and well worth a stop on your way to the beach or if you are within shouting distance in the eastern part of the state. 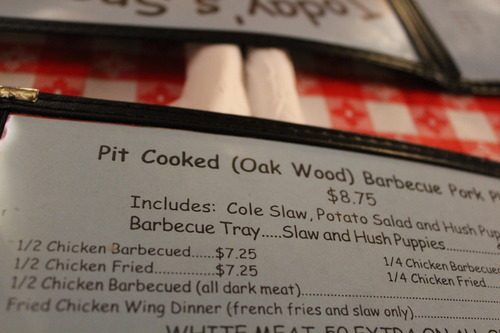 ← Asheville’s new pit boss? 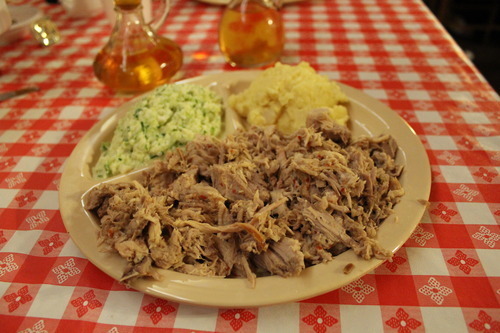 Pingback: Wilber’s Barbecue, Goldsboro NC – Marie, Let's Eat!